The sequel to "The Rosie Project" was, like all sequels in the world, not as good as the first one. In fact, if you know of a sequel that is better than the original, please let me know. The bar was set really high from the first book - the funniest book I've read in a long time, quite possibly the funniest novel I've ever read. So that's hard to top. What really struck me about the first book was that we got to see ordinary life through the eyes of an extraordinary person. 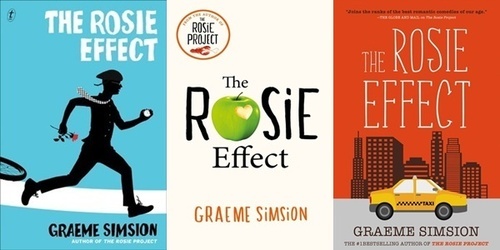 Without giving anything away, I found that the second book, The Rosie Effect, introduced many elements that a normal person would not come across. The people that Don meets, and the scenarios that he goes through become a bit unbelievable, even for Don. It felt like the jokes took too much to setup, compared to the simple, witty remarks and observations made by Don in the first book. I also remember the first book being something I really looked forward to, even if I had a rough day. It was something that I knew would pick me up and make me smile. This second book, however, periodically made me worried! I cared for Don and his life situation, and for a good part of the book, it wasn't looking good. I caught myself becoming concerned for his well-being, and hence getting sad when I could see the train wreck coming. That said, perhaps I should attribute this emotional buy-in to the skill of Simsion's writing. Don't get me wrong, it's still an enjoyable book. I think for me it was a matter of expecting a light, funny book, but getting a slightly heavier, serious book. I still had a few laugh-out-loud's in public and I still wish I was as cool as Don. Maybe I just wish it wasn't a sequel.